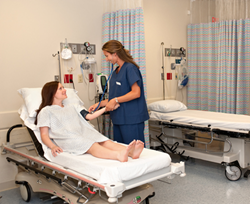 The New Jersey Vein and Arterial Institute offers groundbreaking vascular surgery solutions. Ocean County Foot and Ankle is now accepting patients at a new vascular suite in Toms River. There is a large volume of patients with this condition in the area and we’re giving them an opportunity to get the treatment that they need right here at our office, saving them from a trip to the hospital, or worse, down the road, an amputation. Ocean County Foot and Ankle Surgical Associates, P.C., a well-known Ocean County based Podiatric office with three branch offices in Toms River, Forked River and Whiting, is now accepting patients at their newest location, a vascular suite in Toms River. Operating as NJ VAIN, or the New Jersey Vein and Arterial Institute, this new medical suite offers solutions to patients who suffer from peripheral artery disease (PAD) which causes poor circulation and blockages in the legs and feet. The new 3,460 square foot state-of-the-art facility is specifically tailored for efficiency and patient care, ease of access and patient comfort. Patients are welcomed into a relaxing atmosphere where comfort and safety is of the utmost importance. The lower extremity bypass surgery procedure can take anywhere from 1 to 3 hours and patients are able to leave the premise after a 90 minute recovery period. Patients suffering from peripheral artery disease (PAD) can exhibit symptoms that range from minor discomfort to extreme pain, the inability to walk and in the most advanced cases, the serious risk of limb loss due to lack of blood flow. If you or someone you know is suffering from circulation problems, or more information about Ocean County Foot and Ankle Surgical Associates, P.C., it’s several locations or services, visit OCFASA.com or call 732-505-4500. About Ocean County Foot and Ankle Surgical Associates, P.C. Ocean County Foot & Ankle Surgical Associates, P.C. is a renowned podiatry practice serving residents throughout Forked River, Toms River, Whiting and surrounding areas. Ocean County Foot & Ankle Surgical Associates, P.C. podiatrists are highly educated and specifically trained to treat conditions, diseases and injuries affecting the foot, ankle and leg. A wide range of services including traumatic injury care, pediatric treatments, elective foot and ankle surgery, and more are available at three convenient locations throughout Ocean County and both surgical and non-surgical treatments for a variety of foot problems are available.